Acadiana has its own celebrity baker: Kayla Trahan of The Cake Room. She’s has been on the Food Network’s Cake Wars and won – twice! However, Kayla's more than just an award-winning baker. She’s a business owner with a passion for her craft and a love for her community. I was a science teacher originally. I had been baking for about eight years on the side, just as a hobby. I realized there were a lot of competitions for cake decorating, and that’s what got me more serious about baking. I’m a really competitive person. When I got called to be on the Food Network on Cake Wars and won, I came home and went back to teaching. But then I got called a second time to go and be on the championship episode. I thought to myself, if I win this episode I’m going to quit teaching and open the bakery. It was a little more than a year ago when I won, and then the bakery opened nine months ago. That’s how the bakery came to be! Can you talk more about your experience on Cake Wars? It was really cool. When I first applied, I didn’t even think I would get on the show. I sent in an email and got all the way through the casting process. I actually got turned down initially and then I just forgot about it. But one day, I got a random call and was asked to fly out to be on the show. When I went I did not expect to win at all. I was a teacher going against people who were bakers and had been on past episodes. But, I was so excited to be there and I felt that just being there, on the show was enough. So winning was amazing. When I went on the show a second time I was more nervous. By that point, I felt like I had more to prove. When we won I thought, this can’t even be real life. It was so surreal. The show actually just replayed last night and people called to tell me they were watching me on television. I still can’t believe it. How did your time on Cake Wars influence your baking? In the most literal way I actually learned a lot on the show. In a more funny way, we’re always in a rush at the bakery so I’ll say, “Ok, we’re going into Cake Wars mode.” So we’ll all start rushing around. Also, the show helped prepare me for the stress of running a bakery. I’m pretty good at handling stress these days. I would absolutely do the show again if I was invited. There have actually been opportunities I’ve had to pass on now that I have the business. I don’t have as much freedom to just take off and go because I have client cakes to make. But it’s a balance I’m figuring out, and I think there’s definitely a possibility of me going back on the show. What made you want to own your own bakery? I had owned a bakery at home for a while, and I had even worked for a bakery for a little bit as well. Neither one of those situations worked out well for me. For example, I would stay up all night every night doing my cakes, which would make it hard to go in and teach the next day. So eventually I decided to give up teaching so I could pursue something I really loved to do – which was baking. In order to make this a real living, I knew there was only so much I could do out of my house in terms of volume. I had to take the step forward in owning the business and opening a brick and mortar shop. What do you love about running The Cake Room? Our regular customers. We get to meet so many people, and I love people who come in and just talk about their lives. One specific highlight is that I got to make the cake for the groundbreaking ceremony for Moncus Park – a Lafayette park that will be opening soon. 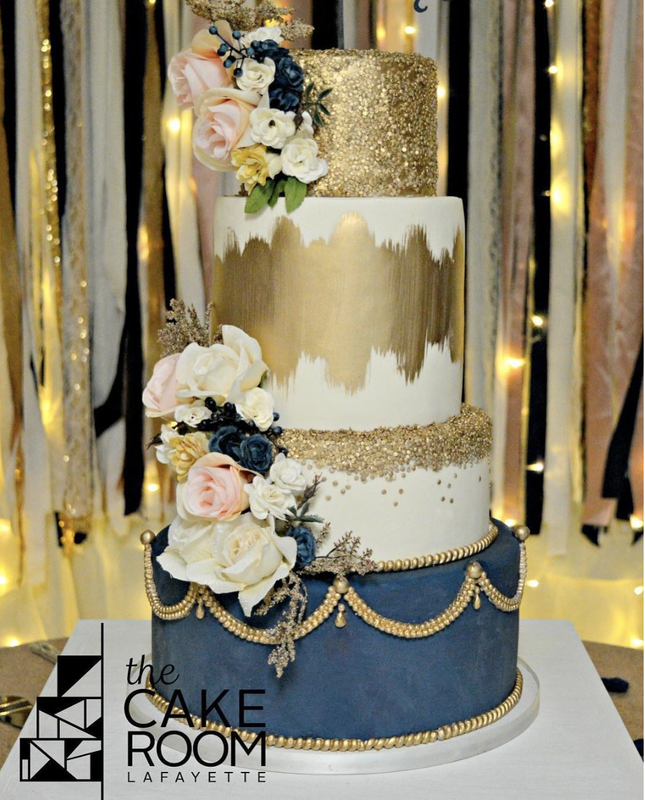 It was a six-foot long cake and weighed around 200 pounds. It was ridiculous, but so cool. I think that’s one of my favorite moments because it was a chance to get involved in the community and then bringing my passion into it. What is your connection to the Acadiana community as a business owner? I think luckily for most local business owners around here, Acadiana is really friendly and personable. I get tons of people who will just call me up and give me tips, and we’ll just chat about business. It’s a real community atmosphere that I enjoy. You might think that the other bakery owners in town would be my competition, but I’m actually really good friends with all the other cake bakery owners in Lafayette. We work with each other and help each other, and it’s a nice support system. What are your dreams for the Cake Room as you continue to move forward? The Cake Room is doing well and growth is what I’m focused on right now. We’re looking to get more cake decorators and growing so that we can serve more people in Acadiana. We’re taking it day by day, but we definitely want to expand. I think it’s important for everyone to know that everything we do in The Cake Room is all local. I’ve had people ask, “What’s the benefit of shopping with you when I can get cakes at a grocery store?” Our hearts go into what we do. We enjoy our work, we have a lot of fun, and we are passionate about everything coming out of our kitchen. Everyone deserves a little sweet every now and then! We agree! When you shop at The Cake Room, you get your sugar fix AND you support a local business. Want to do more to support local businesses in Acadiana? Download Towny. It’s totally free and puts you in the know with all things local.